Bottled water is the bane of my existence as it stands. These companies bottle up tap water from drought-riddled communities and sell it to you for a 1900% profit. It’s one big sham. If you don’t like tap water, just filter your tap water. There are some good ones out there. But make no mistake, bottled water isn’t any better. Even so, we sometimes find ourselves drinking out of plastic and eating off of plastic. Most of our food comes in plastic! What kind of health risks do these various types of plastic pose to us? These bottles are typically single-use bottles. It’s possible that they emit a heavy metal antimony which interferes with hormonal actions in the body. It can also be carcinogenic. These one is the “good” plastic. It poses the least threat to human health. Because of PVC’s heavy chlorine content, dioxins are released during the manufacturing, burning, or landfilling of PVC. Exposure to dioxins can cause reproductive, developmental, and other health problems, and at least one dioxin is classified as a carcinogen. This plastic is often used to make plastic bags and doesn’t pose a significant health risk. This type of plastic also doesn’t pose much of a health risk. This is the plastic commonly used to package yogurt and syrup. PS emits a carcinogen known as Stiren. This type of plastic is commonly used for food packaging and coffee cups. 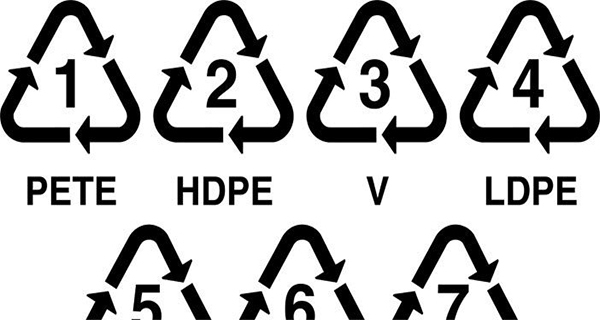 So when looking for the least toxic plastic, look for HDPE and PP. Avoid packaging labeled PETE, PVC, PS and PC.